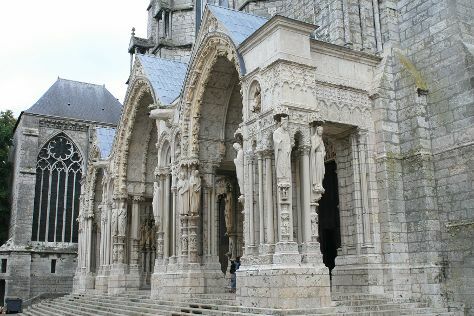 Renowned for its medieval cathedral built on a hill by the left bank of the Eure River, Chartres is a small city in the Centre-Val de Loire region and capital of the Eure-et-Loir department in northern France. It is approximately an hour southwest of Paris by train. You should try some of the delicious local brew, a beer called Eurelienne, with four varieties--blanche (white), blonde, rousse (red), and brune (brown). A local farmer runs the brewery, which conducts tours during the first weekend of every month. Unfortunately, the beer is difficult to find although some area shops sell it as a package, and the Madrigal bar serves all four types. The tourist information center between the train station and the cathedral offers free maps, information, and helpful advice about area's attractions. Chartres is in Eure-et-Loir. You can plan France trip in no time by asking Inspirock to help create your itinerary.